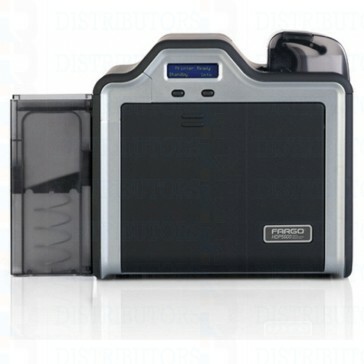 Fargo HDP5000 single-sided high definition reverse-transfer ID card printer with ISO magnetic stripe encoder. Comes with USB and Ethernet interfaces, 2 year printer warranty & lifetime printhead warranty. Fargo HDP5000 (89011) single-sided reverse-transer ID card printer with ISO magnetic stripe encoder. Fargo’s HDP5000 reverse-transfer printers delivers reliability, high definition print quality, and advanced security features with its reverse transfer technology. Reverse transfer printing is done by printing on a clear film and then that image is transferred to the card with pressure and heat creating a permanent bond. The consistency and pliability of the HDP5000's retransfer film allows the printer to print vibrant and consistent images every time. Retransfer technology is ideal for customers who are printing on smart cards that have imperfections from that embedded technology. These imperfections are the leading cause for print head failures on direct to card printers. During the retransfer process, the HDP5000’s print head never makes physical contact with the card allowing Fargo to offer a lifetime warranty on the print head. As demands change over time from card volume to security needs, the HDP5000 gives you the option of field upgrading to double-sided printing, multiple encoding options, single or dual sided lamination, to secure and protect your organizations investment..
HDP5000 produces ID cards with the highest image quality available. By printing a reverse image on the underside of HDP® Film, then fusing the film to the card surface. The HDP5000 creates an image quality that looks more like a sharp glossy photo than an ordinary ID badge. Optional single- or dual-sided simultaneous lamination offers enhanced card security and durability. with your organizations Access Control and security systems. Resolution 300 dpi (11.8 dots/mm) continuous tone. Card Capacity 100-card in-put hopper, 200-card stacker.